BROWARD COUNTY, FLA. - Port Everglades celebrated Arbor Day and the start of its extensive Upland Mangrove Enhancement Project at a native tree planting ceremony today. Partner agencies, environmental groups and residents were in attendance along with local elected officials. 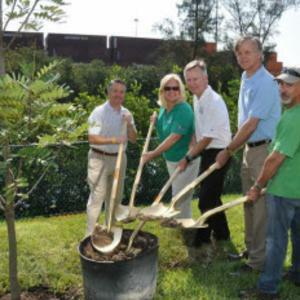 Attendees were encouraged to grab a shovel and help fill in the newly planted Florida-native Paradise Tree at the Port Administration Building and everyone went home with a native plant to create their own Florida-friendly landscaping. Port Everglades partnered with NatureScape Broward - a Broward County program promoting the creation of Florida-friendly landscapes that conserve water, protect water quality and create wildlife habitats - to celebrate the national tree-planting holiday as a way to kick-off its Upland Mangrove Enhancement Project. This is the first part of a much larger construction project, the Southport Turning Notch Extension. Port Everglades is berth constrained and additional dock space is needed for cargo ships, as the Port continues to be Florida’s leader for containerized cargo volumes. The Southport Turning Notch Extension project will lengthen the existing deepwater turn-around area for cargo ships from 900 feet to 2,400 feet, which will allow for up to five new cargo berths. Super Post-Panamax gantry cranes will also be added to serve the existing Southport container berths. The crane rails will be extended to the full length of the extended Turning Notch berth to utilize the existing cranes. The total cost of the Southport Turning Notch Extension is approximately $182 million and will be paid through Port-generated revenue and State of Florida funding. The Upland Mangrove Enhancement Project is a critical part of the Southport Turning Notch Extension because it includes creating a new 16.5-acre upland enhancement area with approximately 70,000 new mangrove and wetland plants to replace 8.7 acres of existing habitat in the Port, as well as completing a number of environmental improvements in West Lake Park. Port officials worked closely with port users, the environmental community and the Florida Department of Environmental Protection (FDEP) to develop the plan for the new mangrove habitat. More than 100,000 mangrove plants have been growing as part of the $15.8 million enhancement project. After the site preparation and planting is completed later this year, there is a one-year “trending for success” waiting period before the FDEP will approve removing the existing mangrove plants, which is anticipated in late 2015. Bergeron Land Development, Inc. is the construction manager for the Upland Mangrove Enhancement project, which is based on a design by DeRose Design Consulting. Earth Balance Corporation is growing the mangroves at two different sites so the plants will be ready to go into the ground once the site work is completed. The Broward County Public Works Department’s Seaport Engineering and Construction Division is overseeing the Upland Mangrove Enhancement and Southport Turning Notch Extension projects. At the crossroads of North-South and East-West trade, Port Everglades is one of the nation’s leading container ports, handling nearly 1 million TEUs (20-foot equivalent units, which is the industry standard for counting containers) annually and serving as a gateway to Latin America, the Caribbean, Europe and Asia. Located in Greater Fort Lauderdale, Florida, Port Everglades is in the heart of one of the world’s largest consumer regions, including a constant flow of visitors and up to 110 million residents and seasonal visitors within a 500-mile radius. Port Everglades has direct access to the interstate highway system and the FEC’s intermodal hub, and is closer to the Atlantic Shipping Lanes than any other Southeastern U.S. port. Ongoing capital improvements and expansion will ensure that Port Everglades can continue to handle future growth in container traffic. A world-class cargo handling facility, Port Everglades serves as an ideal port of entry and departure for products shipped around the world. More information about Broward County’s Port Everglades is available on the Internet at porteverglades.net or by calling toll-free in the United States 1-800-421-0188 or emailing PortEverglades@broward.org. Photo Caption: (l-r) Broward County Commissioner Chip LaMarca, District 4; Diana Guidry, Outreach Coordinator for NatureScape Broward; Robert Carew, NatureScape Broward; Steven Cernak, Chief Executive & Port Director, Port Everglades; and Doug Young, President of South Florida Audubon Society.